Roswell fans, Buffy the Vampire Slayer Season 2 Episode 7 is for you. 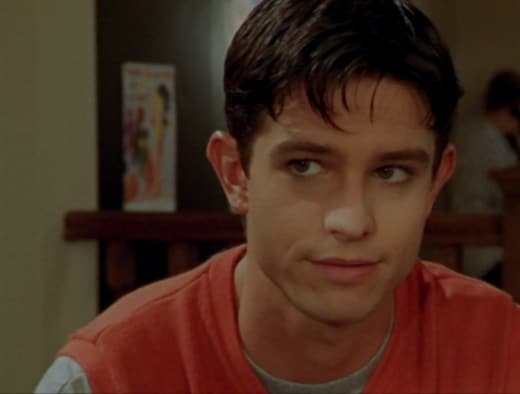 Obviously this was Jason Behr in his pre-alien phase, but it shows where he got his start on The WB. I've only seen a few episodes of the alien drama, so it doesn't affect me much in rewatches since. Still, for the fans of that series, you'll have double the nostalgia. Today, we're rewatching "Lie to Me." Drusilla is the creepiest villain. It's like a horror movie every time she's on screen. I mentioned previously in the rewatch for Buffy the Vampire Slayer Season 2 Episode 1 that the touches added to her scenes heighten her scare factor. The music, the tricks with light, her whimsical attitude...it's all perfection on screen. We will never have enough Drusilla. Her going after the little boy in the playground is very reminiscent of Bram Stoker's Dracula. It's a subtle nod to the brides of Dracula, but the inspirations included in Buffy the Vampire Slayer Season 2 Episode 7 are stronger than ever. As you rewatch the episode, stay tuned for more references to the story. I like that we started getting more backstory about Angel and Drusilla's past. 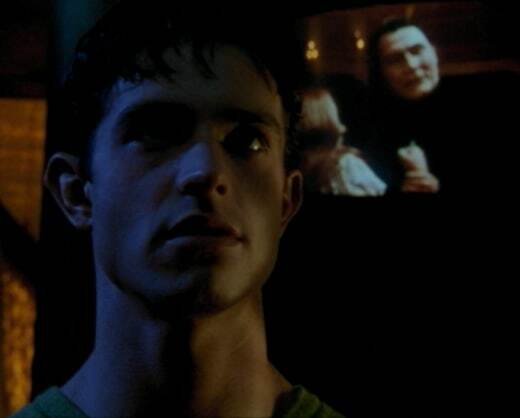 We already learned a bit about Spike on Buffy the Vampire Slayer Season 2 Episode 3. Drusilla was the missing piece to the puzzle. You could feel the history when these two were together. Angel clearly had affection/sympathy for her; similar to the way he cared for Darla. Even though he staked Darla, I don't think he could muster the courage to kill Drusilla at this point. He looked at her as his child. Drusilla: My dear boy has gone all the way, hasn’t he? To her. Drusilla: The girl. The Slayer. Your heart stinks of her. Poor little thing, she has no idea what’s in store. Angel: This can’t go on, Drusilla. It’s got to end. Drusilla: Oh no, my pet. This is just the beginning. Permalink: The girl. The Slayer. Your heart stinks of her. Before finding out he was evil, what did you think of Ford? I'm not a fan of him. He was a little too perfect as Buffy's old school crush and he emerged at such a coincidental time to cause some trouble for the Buffy/Angel romance. Something about him wasn't right. His inclusion into the story, on the other hand, seemed to be a one-off. Similar to Tom in "Reptile Boy," Ford was just a distraction. We also got a lot of exposition about him for just a one-off appearance. Sure, it was used to help give details about Ford's motivation. The plot made a big point to know his sickness, why he moved to Sunnydale, and his past with Buffy. We were meant to feel for him and understand why he wanted to become a vampire. Regardless, his need to become a vampire did not excuse any of the actions he did to become that. I wish there was one or two more episodes with Ford in it. It would've rounded out his story and made us connect with him before realizing that he was truly a desperate villain. The extra episodes would explain some of the plot holes, like how did he really learn about vampires? How did he know Buffy fought vampires? Willow: So, you two were sweeties in fifth grade? Buffy: Not even! Ford wouldn't give me the time of day. Ford: Well, I was a manly sixth grader. Couldn't be bothered with someone that young. I thought we were over the Buffy and Angel "are they/aren't they?" storyline. For a few episodes now, they looked to be on a steady path. I mean, we just had their first coffee date on Buffy the Vampire Slayer Season 2 Episode 6! These random conflicts do become annoying as I rewatch the series again. Why did it have to be this complicated? Why couldn't they simply admit they liked each other and move on? Ford's inclusion, beyond being in the vampire cult, was just another way to cause tension in the romance. By this point in Buffy the Vampire Slayer, it's been done to death already. And, furthermore, why couldn't Angel tell Buffy that Drusilla was in town? Drusilla is a dangerous vampire that is known to be connected to Spike. Eventually she would find out the truth that this vampire was still alive. Poor decisions on Angel's part to keep it hidden. I do like that Angel went out of his way to do some digging on Ford. He was concerned for Buffy and he needed help. Plus, his scenes with Willow were so hilarious; it was one of the comedic highlights. The vampire cult/club, like Ford, is a concept I wish lasted more than one episode. There was so much potential to feature more members of the group and showcase their obsessions with vampires. Regular humans being attracted to the unknown is an idea that seems complementary to this sci-fi tone. it adds another layer to the dark side of Sunnydale. Angel did this well with having the bar that supernatural and human characters would visit. We had a little bit of it starting in Buffy the Vampire Slayer Season 3, but I could've used more of it here. Side-note to new fans: If anyone new in Sunnydale is cool, calm and collected after seeing a vampire attack, they're clearly up to something. Ford didn't even flinch after seeing Buffy slay the vampire. He was also too calm during his first night on patrol. Come on, even Willow and Xander were freaked out after seeing their first vampires on Buffy the Vampire Slayer Season 1 Episode 2. Ford was too calm during the attack. The red flag warnings should've gone up. Also, the fact that the vampire he supposedly dusted was still alive (and stole a book no less) was the defining moment. Buffy needed to realize sooner that Ford couldn't be trusted. There was a looming question I had after rewatching "Lie to Me": Did Ford already know Buffy was the Slayer? Moving to Sunnydale and coincidentally finding the Slayer seemed too lucky. By the time we met him, the club was already set up and he was looking for vampires, but the execution for all of that needed a lot of pre-planning. Him being in Sunnydale had to be for a specific reason. He got handed a lot of lucky breaks, especially with being led to Spike and Drusilla. He had the bargaining chip ready to go for becoming a vampire. Permalink: I love you. I don't know if I trust you. Buffy and Angel's chat on Buffy the Vampire Slayer Season 2 Episode 7 might be the most real they've ever been with each other. It's surprising to see them be open. Usually Angel was closed off and mysterious while Buffy pushed people away. If we're being honest with ourselves, they did not have a healthy and sustainable relationship. Angel telling Buffy the truth about Drusilla might be the turning point in their relationship. This was a painful moment in his past, and him coming clean opened himself up to her that he hadn't done so before. It was the start of the next phase of their relationship. She could finally trust him. Also, it was great to get the backstory about Drusilla's character. Their complicated vampire family tree finally started making sense about how she was connected to Darla, Angel and Spike. 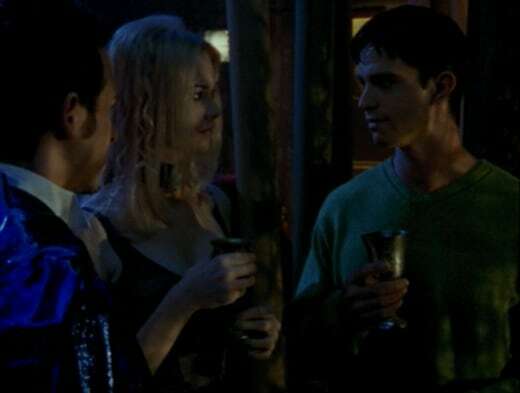 Angel: I did a lot of unconscionable things when I became a vampire. Drusilla was the worst. She was an obsession of mine. She was pure, and sweet, and chaste. Angel: First I made her insane. I killed everybody she loved, visited every mental torture on her I could devise. She eventually fled to a convent, and on the day she took her Holy Orders, I turned her into a demon. Buffy: Well, I asked for the truth. Permalink: I did a lot of unconscionable things when I became a vampire. Drusilla was the worst. Buffy stopping the vampire cult and saving them seemed like a given. Regardless of what they wanted, Buffy isn't the type of person to let almost 10 people die. This would've been a bloodbath of epic proportions. I felt a little bad for Ford in his plight. He truly wanted to live. His touching moment reminded almost of Buffy's pleading in Buffy the Vampire Slayer Season 1 Episode 12. Just like her, he could see his impending death and he didn't want it to happen. However, my sympathy went out the window when he knew the others were going to die. He had Chantarelle, Diego and the rest of the followers set up as fodder. Ford was desperate and heartless. Ford: I will become immortal. Buffy: Well, I've got a news flash for you, brain trust. That's not how it works. You die, and a demon sets up shop in your old house, and it walks, and it talks, and it remembers your life, but it's not you. Buffy: And your life is nothing? Ford, these people don't deserve to die. Ford: Well, neither do I! But apparently no one took that into consideration, 'cause I'm still dying. I look good, don’t I? Let me tell you something, I’ve got maybe six months left and by then what they bury won’t even look me. I will be bald, and shriveled, and smell bad. No, I’m not going out that way. Permalink: Ford, these people don't deserve to die. For those of you who are new to Buffy the Vampire Slayer, the blonde member of the vampire cult will become an important character later on in the Whedonverse. We see her against in Buffy the Vampire Slayer Season 3 Episode 1, but we also have her as a recurring character on Angel the TV series. It's fun to see the growth of these minor supporting characters. She barely had any lines on "Lie to Me." We will start to see Chantarelle's (who becomes Anne) character growth as the series progresses. Did anyone else love the Ford vampire twist? I thought it was quite clever. He got what he wanted: Spike turned him into a vampire. However, Buffy staked him immediately after he rose from the grave. After everything Ford did to live, he died right away. This was a perfect end twist to show that eternal life was not absolute. Even though vampires and demons are presented to us as immortal, they never truly live forever. Vampires were killed off almost every episode...and those were former people too. Ford had no guarantee that he would get the life he lost. Regardless of what he did to get there. Giles: Yes. It's terribly simple. The good guys are always stalwart and true. The bad guys are easily distinguished by their pointy horns or black hats, and we always defeat them and save the day. No one ever dies and everybody lives happily ever after. What did you think of "Lie to Me"? Do you think Angel telling Buffy about Drusilla brought them closer together? Did you feel bad for Ford? Would you visit the vampire club? Want to join us in rewatching Buffy the Vampire Slayer? We will be posting new rewatch posts every Tuesday and Thursday. Come back here and let us know what you think of the episode.